GREAT videos! Each includes multiple, well explained painting demonstrations. Buy Any DVD for only $35. $7 shipping & handling (1-4 videos) to USA. DVD videos are formatted to the NTSC system used in the USA and Canada. PAL, the system used in Europe, is not available. This exciting video shares key secrets to painting enriched, beautiful flowers in watercolor. In Part 1, Ken introduces an easy four-value painting system as he guides you through a simplified painting of pansies. 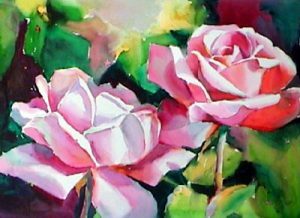 In Part 2, he emphasizes exaggerated light shapes and shadows to create the curving forms of roses. Both paintings are explained as they progress, giving insight into the artist's thinking. Quickly capture the impression of trees reflecting in a forest lake. 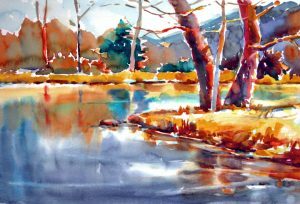 Ken shows two short watercolor demonstrations of technique, followed by a complete painting demonstration.This is the newest in our video collection and a 'must have' for landscape painters. (Although this is an older video, we bring it back by popular demand.) Ken presents unique color ideas for anyone wishing to paint with dramatically enriched, yet believable color. He focuses on three secrets to achieving color harmony and provides a practical system to organize your color thinking as you paint. He also takes you on a tour of his color wheel of very intense tube colors. 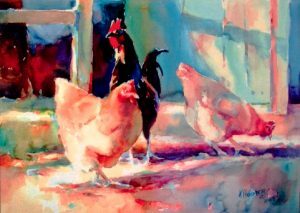 Painting demonstrations include: (1) a rooster with chickens, (2) landscape of barn and trees in the snow. 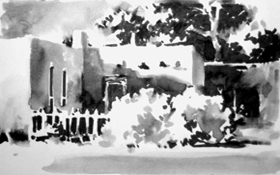 This fascinating ink wash method started over 20 years ago as a simple teaching tool. Today it has evolved into a mainstay for developing painting ideas. This video includes three complete ink demonstrations: (1) landscape with adobe, (2) cone flowers, and (3) cattle. In the Gallery, Ken presents a valuable reference guide of eighteen ink sketches, of which ten are accompanied by the resulting completed painting.